Need to get rid of Box Elder Bugs? Box elder bugs (Boisea trivittata) are given their name because of the tree that usually hosts them – the box elder tree. They are half-inch bugs in length with red stripes on their wings. When spring rolls around, these bugs hatch not just in box elder trees, but also maple, ash, and fruit trees. 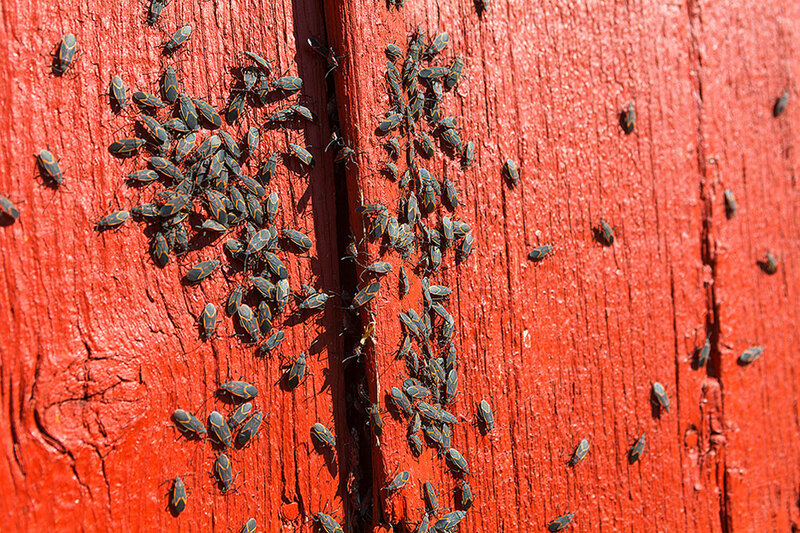 As the weather starts to cool in the fall, box elder bugs may become unwelcome guests in your home. They are not a structural pest, but their numbers can build up in your attic, on your siding and elsewhere in your home. They very rarely bite, but they are a nuisance. While they don’t eat fabric, they can leave stains with their excrement. Also, if you happen to squish one, you’ll notice a foul smell. Controlling box elder bugs is difficult. The best time to treat for them is when they are out in numbers on your siding. You can treat for them in the spring when they emerge from hibernating under your siding or in your attic, as well as in the fall when they return to those areas. Both seasons, spring and fall, are good times to treat. Box Elder Bugs usually require multiple treatments. To prevent box elder bugs you must seal cracks and crevices which these pests use as access points. Box elder bugs can squeeze through very small spaces, so you have to be thorough. If there is a hole in your screen or a crack a window, they’ll find it! Make sure everything is sealed up tight. You can weather strip your windows and doors, caulk around window sills and siding, and pay special attention to the eaves of your roof where the rafter tails extend out at the vents and at the bird blocks. Sealing out the box elder bug is the most effective way of dealing with them. If you have a lot of box elder bugs and they are already inside, you can remove them with a shop-vac. Don’t forget to remove the bag so you aren’t left with a foul smell. Box elder bugs want to get into your home. If you have an issue with box elder bugs and want additional information, please call our office for prevention and treatment options.